With On Loving Women, the Quebecois artist Diane Obomsawin has made a very unique-looking contribution to the already large genre of biographical stories, and more precisely of lesbian biographical stories: from talks with female friends ranging in age from thirty to seventy 1, she’s drawn a series of short accounts of their budding attractions to other women when they were young, of their relationships, and for the older ones, of their trying to navigate the muddy waters of criminalizing or oppressive law. The ten stories (from nine friends, plus herself) included by the author in this book2 are told in a conversational tone that puts the reader at ease and are drawn in a minimalist style that also helps the reader to identify with these people drawn with animal heads. Some of those stories are light, some are far sadder, and one might think nothing very original is said. But apart from the fact that I think that we always need more accounts of queer lives (especially for those who’ve live in more troubled times), it’s Obomsawin’s storytelling and art that makes the book stand out from the crowd. As you can see from the excerpts, she never goes for the flashy choices, either in the drawing themselves or in the layouts. But there are lots of nice touches in the storytelling, such as the last three panels in the page shown on the right. 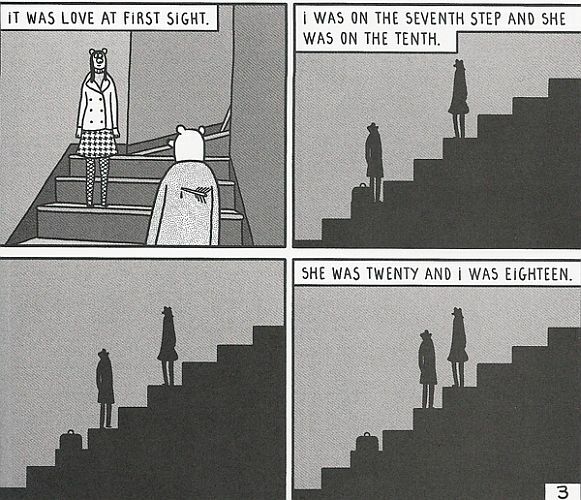 The position of the two women on the stairs serve as a metaphor for their differences and their willingness to close that bridge, and it’s all done with a small number of lines drawn and words used. 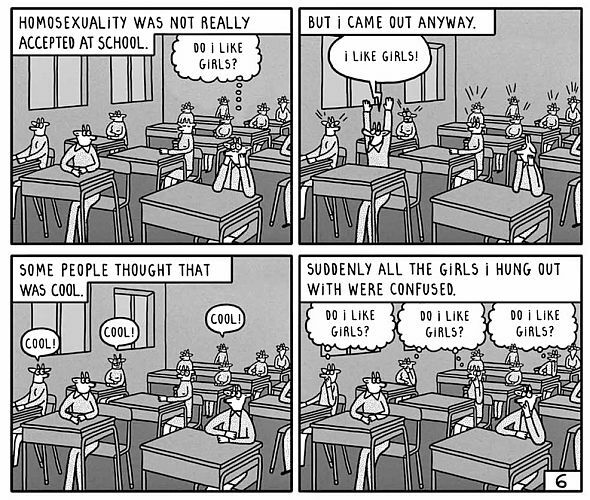 There’s also a lot of humor in those stories, sometimes in the dialog or the situation, but above all in Obomsawin’s choice of illustrating these situations—see for example the last panel of the page on the left, where a schoolgirl causes her all-girl class to question their sexuality. Humor also comes from the faux naive illustrations scattered throughout the book, such as electricity striking the narrator as she falls instantly in love when meeting another woman, with the text “I was electrified”. It also seems to me that drawing her characters with various animal heads gives a fairy tales aspect to stories which are as realistic as they come, adding yet another layer to the reading experience. I’d even go as far as saying that it gives a feeling of slight absurdism that spices up the otherwise gentle humor. 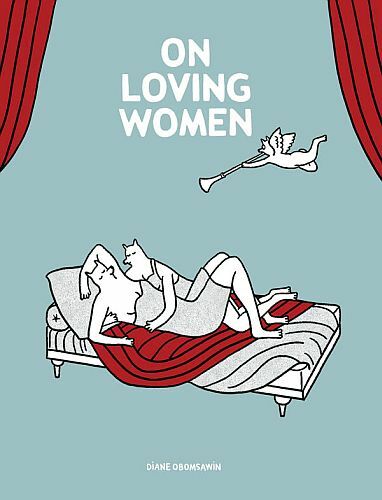 On Loving Women is book that manages to combines realism and humor, personal stories and historical value, in a way that makes me feel like reading the other books of Diane Obomsawin3. In the interview mentioned in the notes below, a possible sequel is hinted at, this times with interview of strangers. That is definitely a project I’d like to see come to fruition. The 88-page softcover is published by Drawn & Quarterly, and is available everywhere, including at Amazon.